Food for Thought! : Blog Awards: "Itni Shiddat se maine tujhe paane ki koshish ki hai..."
Blog Awards: "Itni Shiddat se maine tujhe paane ki koshish ki hai..."
"Itni Shiddat se maine tujhe paane ki koshish ki hai; ki har zarre ne mujhe tumse milane ki saajish ki hain"...lol. I am really delighted and excited to receive my third Blog Award. Appreciation from peer blog buddies always thrills you! Thnx a lot Surbhi for Awarding me! 1. In order to accept this award, please post it on your blog with the name of the person awarded it including the link to his blog. 2. Pass on the award to 5-10 of your most loyal followers.- Contact those followers and let them know they have been chosen for this award. 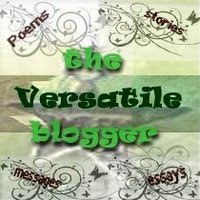 I take this opportunity to Award "The Versatile Blogger" Award to the following blog buddies. Another Award which I received earlier from Choco Desserts but I wasnt knowing the rules of acceptance. 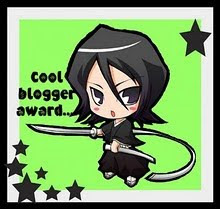 So I take this opportunity to award it to following "Cool" blog buddies! Congratulations Karan....aap iske haqdaar hain ! !I am very happy for you. Thanks a lot for thinking of me ,i am honored . Had been meaning to visit your page.Congratulations on your awards. Well-deserved indeed:) Keep writing!!!! Thank you so much for being there and motivating me! I am flattered by your kind words!